The annual Birds of Prey World Cup races at Beaver Creek may have been canceled, but a roster of America’s finest World Cup skiers will be on hand Dec. 3 to honor one of the most talented surgeons in sports medicine history: retired Dr. Richard Steadman. “The Grateful Steadys” is the moniker of a loose confederation of grateful patients, athletes, Fellows, MDs, friends, and fans brought together by a quartet of Olympic skiers to honor retired local orthopedic pioneer, Dr. Richard Steadman. Like many of their peers, the “Core Four”—Andy Mill, Cindy Nelson, Edie Thys Morgan and Christin Cooper-Taché — owe their careers, and post-career active lives, to Steadman’s interventions, and felt it was time for the skiing world to gratefully acknowledge the impact this one man has had on the sport. The campaign launched a year ago with the commissioning of a life-size bronze bust by renowned sculptor, Bruce Wolfe, and was followed by a robust grassroots fundraising campaign to the Steady faithful around the world. The response was immediate and overwhelming. With fundraising now complete, the campaign reaches its pinnacle on Saturday Dec 3rd with the unveiling of the original bronze during a U.S. Ski Team Alumni event, hosted at SaddleRidge in Beaver Creek. 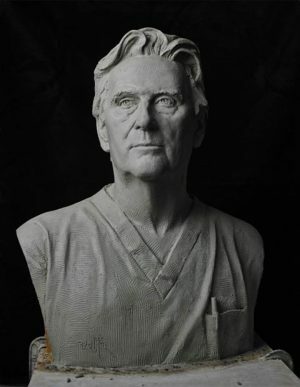 The statue will reside in the Steadman Philippon Research Institute wing of the new Vail Valley Medical Center. Two identical replicas were cast – one to reside in the US Ski Team’s Center of Excellence, in Park City, Utah, and the other in the Steadman residence. Other Grateful Steady party elements include a tribute video (created by Vail’s Hayden Scott of Ee4KProductions) documenting Steadman’s career, with testimonials by champion skiers and patients. Many will be in attendance, with a select few speaking to Steadman’s impact on their lives and careers. An award-winning innovator in the field of orthopedic sports medicine, Steadman became a legend for his pioneering approach, which got world-class ski racers back on skis in record time, helped weekend warriors return to active recreation, and enabled professional athletes from nearly every sport to return to the playing field stronger than before. In 1963, after earning his medical degree from the University of Texas Southwestern Medical School in Dallas, Steadman went to work in South Lake Tahoe, California, as an orthopedic surgeon at Barton Memorial Hospital. When he volunteered his services at a World Cup ski race in Heavenly Valley in 1973, a long and exciting relationship with the U.S. Ski Team began. Soon, he was pioneering significant improvements in post-surgical rehabilitation developing novel exercise protocols that shook the foundations of sports medicine. In 1974, U.S. Ski Team star Cindy Nelson became the first elite skier to be treated by Dr. Steadman. Nelson would undergo 11 surgeries in her 14-year career, without ever missing a full season, winning Olympic Downhill bronze in 1976, along with a trio of World Championships medals and six World Cup races. Legions of USST athletes coursed through Tahoe over the next decades, often taking up residence in the Steadman home, as revolutionary protocols were tested, and proven sound, first on his living room floor, then out on the race courses. Nelson, working as Vail’s Director of Skiing, and former Vail Associates owner George Gillett were instrumental in persuading Steadman to leave Lake Tahoe in 1990, with the promise of expanded research, treatment and training facilities in Vail. Steadman has treated well over 22,000 patients during the course of his 40-year career in Tahoe and Vail. In addition to members of the U.S. Ski Team, the list includes such legendary athletes as tennis greats Martina Navratilova, Monica Seles and Billie Jean King, NFL Hall of Famers Dan Marino and Bruce Smith, musicians Judy Collins and Rod Stewart, and global soccer sensations Ronaldo and Lothar Matthaeus. Steadman became a consultant to the Denver Broncos and Colorado Rockies while serving as U.S. Alpine Chief Physician at nine consecutive Olympic Winter Games from 1976 through 2006. Steadman’s Internationally renowned advanced surgical protocols and innovations include: Microfracture, a procedure that repairs the damaged joint and encourages the regrowth of articular cartilage; Healing Response, an arthroscopic alternative to full knee reconstruction; and The Package, a collection of arthroscopic procedures performed in a single operation, for which Steadman received a research award in 2012. Today, the Steadman Philippon Research Institute (SPRI) in collaboration with the doctors of the Steadman Clinic, is known worldwide for its unprecedented clinical database and research into orthopedic injuries of the knee, hip, shoulder, ankle and spine. As part of Dr. Steadman’s early vision, The Steadman Clinic and SPRI will be housed in the new 59,000 square foot Vail Valley Medical Center (VVMC) providing state-of-the-art medical facilities and patient care as part of the community hospital’s multi-year renovation and expansion. This first phase, the west wing, will open in 2017. Dr. Steadman’s pioneering spirit, surgical prowess, revolutionary advancements and uncommon devotion to treating the whole patient, left a distinctive and lasting impact in the field of sports medicine, in the lives of everyday people, and across many pro sports, particularly the US Ski Team. The December 3rd tribute is a massive thank you from “Grateful Steadys” everywhere, in the ski industry, the medical community, and beyond.